Joseph’s brothers were jealous of him. They sold him as a slave! Then a woman lied about him, and he was put in jail! But God turned everything around. Joseph’s older brothers could tell that their father loved Joseph most. Jacob even gave his young son a special coat. When Joseph saw his brothers doing bad things, he told his father. He also told his family about dreams he had. The dreams seemed to say his family would bow down to him! All of these things made his brothers mad at Joseph. They were jealous and became more and more angry. Jacob sent Joseph to check on his brothers. They saw him coming and talked about killing him! But Reuben told them to throw Joseph in a pit instead. When a group of traders went by, Judah said, “Let us sell him.” The traders gave the brothers money for Joseph, and he became a slave. But the brothers didn’t tell their father the truth. They tricked him. They put blood on Joseph’s special coat, so Jacob thought Joseph was dead! Meanwhile, the traders took Joseph to Egypt where he served Potiphar. In spite of all he went through, Joseph worked hard. He obeyed God, and he pleased Potiphar. God blessed Joseph’s work, and He blessed Potiphar because of Joseph. Potiphar knew he could trust Joseph, and he put him in charge of everything he owned. But then Potiphar’s wife tried to get Joseph to break God’s law. Day after day she tempted him. But Joseph refused. One day she was alone with Joseph and tried to tempt him again. This time she grabbed his clothes, and he ran. She became very angry. She still had some of Joseph’s clothes she had pulled off of him. So she lied to her husband. She said that Joseph had tried to hurt her. Potiphar was very angry and put Joseph in prison. Joseph must have been discouraged. He was being punished for something he didn’t do. But still Joseph worked hard and obeyed God. And God gave him favor with the keeper of the prison. The keeper of the prison knew he could trust Joseph, and he put him in charge of all the prisoners. One day the king put his butler and his baker into the prison. Joseph took care of them. And one night the butler and the baker both had dreams. They were sad because they didn’t know what the dreams meant. Joseph told them that God could show them what the dreams meant. And God showed Joseph the meanings of the butler’s and baker’s dreams. The baker would be killed. But the butler would get his job back. Joseph asked the butler to tell the king about Joseph to get him out of the prison. But the butler forgot Joseph. So Joseph was in the prison two more years. Then the king of Egypt had two dreams. He was troubled, but he couldn’t find anyone who could tell him what his dreams meant. Then the butler remembered Joseph. He told the king that Joseph could tell the meaning of dreams. The king sent for Joseph. He told Joseph he had heard that Joseph could interpret dreams. But Joseph said it was God who would give the king the meaning. He then explained that both of the king’s dreams were about seven good years and seven bad years. During the first seven years, Egypt would have more than enough food. During the seven bad years, very little food would grow. Joseph suggested to the king that he should find a wise man to prepare for the bad years. They should store up food during the good years. Then they would be saved from hunger during the bad years. The king decided this was a good idea. He chose Joseph to be the man in charge of preparing. Joseph went from being a prisoner to being second in charge in one day! Again, God blessed everything Joseph did. Egypt saved enough food for themselves, and more to sell to people from other countries. When the bad years came, Joseph’s father sent Joseph’s brothers to buy food in Egypt. When they saw Joseph, they didn’t know it was their brother. But he knew who they were. Joseph asked them about their father. He also wanted to know about his younger brother, Benjamin. He wanted to see his brother so much, he told his brothers not to come back unless they brought Benjamin. But Jacob didn’t want to lose his youngest son. He thought Joseph was dead, and he didn’t want to risk losing Benjamin. Finally, all the food was gone, and Jacob reluctantly allowed Benjamin to go to Egypt. The brothers bowed down before Joseph. They still did not know who he was. But when he decided to keep Benjamin from leaving Egypt, the brothers begged him to let Benjamin go. They worried that their father would not be able to take the loss of his youngest son. He told his brothers to hurry and bring his father and the whole family down to Egypt. Then they would have food for the rest of the bad years. Jacob was shocked to hear that Joseph was still alive! He was so happy to see Joseph again. This story unfolded over many years, but it turned out for the best because Joseph faithfully obeyed God. God blessed the whole family through Joseph. The one who was a slave became the one God used to save them. Was Joseph wise to tell his brothers about his dreams? Why were Joseph’s brothers jealous and angry? 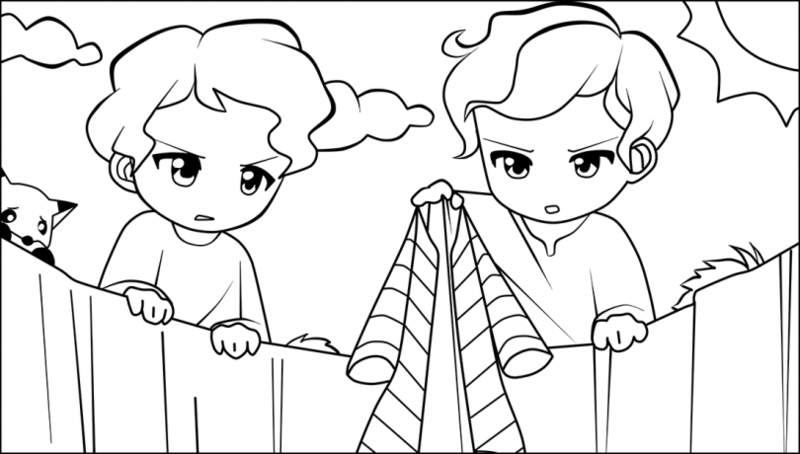 What should Joseph’s brothers have done? Why did God allow Joseph to suffer? Why did God bless Joseph? Read more about these events in Genesis chapters 37 to 47.